What subnet mask would be used if a company using 172.16.0.0 wants to leave 6 bits for host bits? What is the function of a CSU/DSU? It converts user data into an acceptable form to be sent over a WAN link. It protects user data from unauthorized access when transmitted over a WAN. It limits the geographic area in which a WAN operates. It converts between temporary and permanent WAN connections. A company is planning to subnet its network for a maximum of 27 hosts. Which subnet mask would provide the needed hosts and leave the fewest unused addresses in each subnet? A network administrator is required to use media in the network that can run up to 100 meters in cable length without using repeaters. The chosen media must be inexpensive and easily installed. The installation will be in a pre-existing building with limited cabling space. Which type of media would best meet these requirements? What type of network cable is used between a terminal and a console port? Which device is used to create or divide broadcast domains? How many host addresses may be assigned on each subnetwork when using the 130.68.0.0 network address with a subnet mask of 255.255.248.0? Which option identifies the primary interface which would be used for initial configuration of a Cisco router? Which subnet mask would be assigned to the network address of 192.168.32.0 to provide 254 useable host addresses per subnetwork? What does the term “attenuation” mean in data communication? 14. At which layer of the OSI model does the device reside that is functioning as the default gateway for hosts on a network? 15. A company is planning to subnet its network for a maximum of 27 hosts. Which subnet mask would provide the needed hosts and leave the fewest unused addresses in each subnet? Refer to the exhibit. A network administrator is planning the addressing scheme for the LAN using 172.25.14.0/26. The hosts are to be assigned addresses 172.25.14.1 – 172.25.14.25. The LAN interface of the router is to be configured using 172.25.14.63 as the IP address. What would describe this addressing scheme? • The LAN is being addressed properly. • The subnet that is being assigned is not a usable subnet address. • The router LAN interface is being assigned a broadcast address. • The subnet mask does not allow enough host addresses in a single subnet. Refer to the exhibit. A student in the Cisco network class has designed a small office network to enable hosts to access the Internet. What recommendation should the teacher provide to the student in regards to the network design? • Replace the Layer 2 switch with a hub. • Replace the Layer 2 switch with a router. • Replace the Layer 2 switch with a bridge. • Replace the Layer 2 switch with a transceiver. 18. Which type of routing allows routers to adapt to network changes? • No routing is necessary. 20. Given a host with the IP address 172.32.65.13 and a default subnet mask, to which network does the host belong? 21. What header address information does a router change in the information it receives from an attached Ethernet interface before information is transmitted out another interface? • The host subnet mask is incorrect. • The host is not configured for subnetting. • The default gateway is a network address. • The default gateway is on a different network than the host. • The host IP address is on a different network from the Serial interface of the router. Refer to the exhibit. 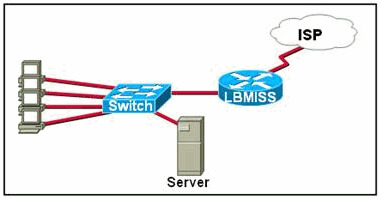 The network administrator has assigned the internetwork of LBMISS an address range of 192.168.10.0. This address range has been subnetted using a /29 mask. In order to accommodate a new building, the technician has decided to use the fifth subnet for configuring the new network. By company policies, the router interface is always assigned the first usable host address and the workgroup server is given the last usable host address. 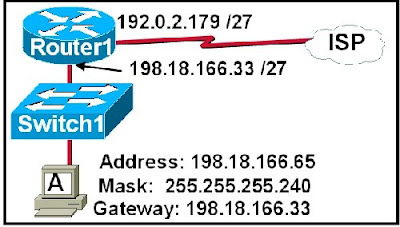 Which configuration should be entered into the IP server properties to get connectivity to the network through the router? 24. How does a router decide where the contents of a received frame should be forwarded? Refer to the exhibit. A newly hired technician is testing the connectivity of all hosts by issuing a ping command. The technician notices that a default gateway is not configured on all the hosts, but all hosts have connectivity between hosts, a fact which seems to confuse the technician. How would you explain the connectivity to the technician? • The hosts are detecting the default gateway configured on the hub. • The hosts are all in one LAN, so default gateway information is not needed. • The hosts in the network only require that one host has a gateway configured. 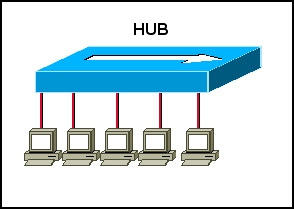 • The hosts in the network would only need a gateway if a switch replaces the hub. • The hosts are using broadcast to reach each other since no gateway is configured. 26. What do switches and routers use to make forwarding decisions? • Switches and routers both use IP addresses. • Switches and routers use both MAC and IP addresses. • Switches use IP addresses. Routers use MAC addresses. • Switches use MAC addresses. Routers use IP addresses. • Switches use MAC and IP addresses. Routers use IP addresses. • The default gateway is a broadcast address. • The default gateway is on a different subnet from the host. 28. How does subnetting provide some level of security in a network? • The number of switches must increase. • The collisions prevent the copying of data. • The broadcasts are contained within a subnet. • The number of host IP addresses is increased. Refer to the exhibit. 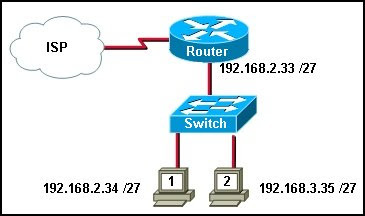 After host 2 is connected to the switch on the LAN, host 2 is unable to communicate with host 1. What is the cause of this problem? • The subnet mask of host 2 is incorrect. • Host 1 and host 2 are on different networks. • The switch needs an IP address that is not configured. • The router LAN interface and host 1 are on different networks. • The IP address of host 1 is on a different network than is the LAN interface of the router. 30. What is the purpose of a subnet mask in a network? • A subnet mask is not necessary when a default gateway is specified. • A subnet mask is required only when bits are borrowed on a network. • A subnet mask is used to determine in which subnet an IP address belongs. • A subnet mask is used to separate the 48-bit address into the OUI and the vendor serial number. 31. Refer to the exhibit. A technician is planning an addressing scheme for a branch office as shown in the exhibit. What is the status of the intended network? • The configuration will work as planned. • The subnetwork mask of host A is incorrect. • The default gateway of host A is a network address. • The addresses on the router LAN interfaces are on the same subnetwork. • The IP address of host A is on a different subnetwork than the subnetwork that the Ethernet router interface is on. 32. What is the primary purpose of a routing protocol? • Layer 3 header is removed and replaced at every Layer 3 device. • Layer 2 and Layer 3 addresses do not change when the packet traverse. • Layer 3 source and destination addresses do not change when the packet traverse. • Layer 2 frame header and trailer are removed and replaced at every Layer 3 device. • Layer 2 source and destination addresses do not change when the packet travels. 34. Which type of routing uses manual entry of information and does not scale well in large internetworks? 35. Company XYZ uses a network address of 192.168.4.0. It uses the mask of 255.255.255.224 to create subnets. What is the maximum number of usable hosts in each subnet? 36. A company is using a Class B IP addressing scheme and expects to need as many as 100 networks. 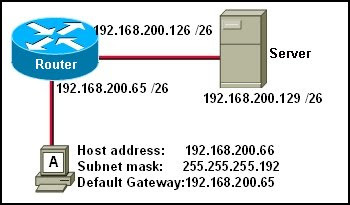 What is the correct subnet mask to use with the network configuration? 37. Which device would add security to a network by not forwarding broadcasts? 38. An IP network address has been subnetted so that every subnetwork has 14 usable host IP addresses. What is the appropriate subnet mask for the newly created subnetworks?